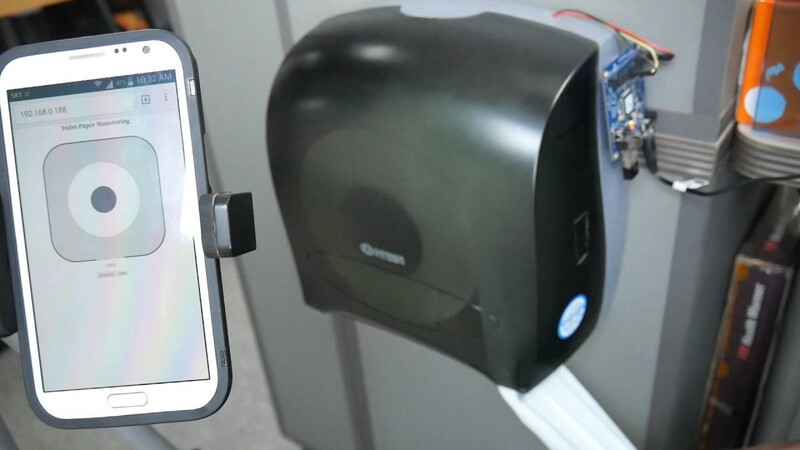 This project help caretakers save time for manually checking toilet-paper, especially in a high and large building where there are a lot of toilet. Caretakers just need to sitt down on the chair and check toilet paper via smart phone. when knowing the thickness, we can visualize it on canvas. The server side program (task0.php) is get distance from distance sensor and send this distance to client side program (index.php) in web browser via websocket. The calculation of thickness and scaling is performed on client side program. // 1st capture value ("get count 0") is always zero. var REAL_DISTANCE_MIN = 0.5; // in centimeters. This parameter is got from measurement with a full paper-roll. Last edited by Khanh; 02-28-2018, 03:29 PM.